Payment Depot was founded in 2013, and provides business owners with the ability to process payments through terminals, mobile devices, online portals, and point-of-sale systems. They refer to their services as “merchant account providing”, and actually process payments through the larger First Data network. This company is headquartered in California, and bills itself as the only payment processer that offers wholesale rates. 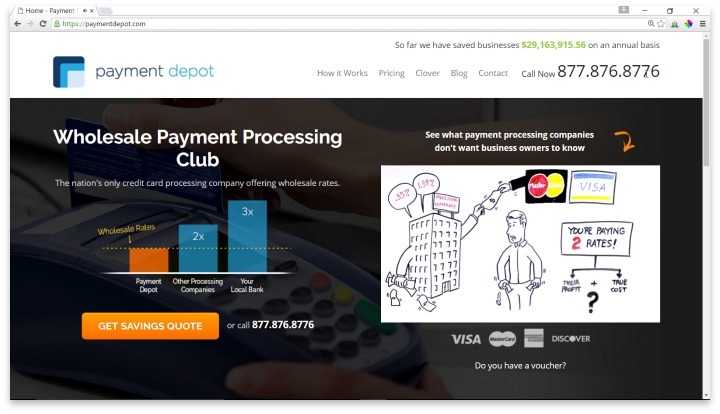 While it may be a relatively new company, especially in the world of payment processing, Payment Depot is quickly jumping to the attention of major merchants around the world. Their contract is very minimal, and all signing up can be done online in less than half an hour. You can get an account open in a single day, and that’s very important for many businesses who can’t afford to wait before they start processing payments. Payment Depot’s payment structure is unique to the industry. First, there is no cancellation fee if a merchant decides that Payment Depot isn’t for them. And on top of that, Payment Depot offers an unheard-of 90-day trial to decide if you like their service; decide against using them at the end of that time, and you receive a partial refund. There is also no set up fee. The rates you pay are a simple transaction fee and a wholesale rate based on the card brand. Payment Depot doesn’t add a markup on top of the wholesale rate, which most card processors do. The per-transaction fee is how Payment Depot makes their money, and the fee is based on the dollar amount of the charge. The basic membership is 25 cents on the dollar, while the value membership is 10 cents on the dollar. Users must meet a certain monthly quota in order to qualify for the lower transaction fee. All pricing, fees, terms, and other information are posted on Payment Depot’s website, meaning that you can fully review their practices before ever trying their 90-day trial. They offer 24/7 phone support, but no live chat option on their website. Their features are standard for the industry, including terminal rentals and payment gateways for all the important areas. Funds are processes and deposited within the industry standard timeline, and reports can be accessed online at any time. While the company hasn’t had enough time in the industry to really gain many user reviews, that may be a good thing: there is also a noticeable lack of negative reviews, which you might expect for a company that could still be learning. While Payment Depot doesn’t offer anything truly unique or innovative in the way of services, it’s clear that they are providing payment processing satisfactorily, at good prices, and are growing more popular by the minute. Payment Depot is quick and easy to sign up for a merchant account account with no cancellation fees. There are many merchants who could benefit from a service like Payment Depot, but the real winners here would be small to medium-sized businesses, or very busy startups. If you don’t have the time, the knowledge, or the desire to spend negotiating your rates and features with companies that have been in this business for decades, and you just want to know exactly what you are getting into before you sign up, then Payment Depot is a great option. You can clearly review the payment plans and features on their site, and you’ll have access to a wide variety of modern features that will make it easy to accept payments in all the most important ways. Have you had an experience with this company? Please share your Payment Depot reviews below.